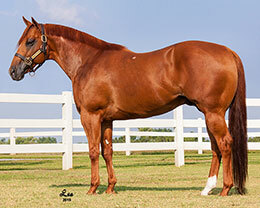 Dominyun sired a finalist to the $100,000 Remington Park Oklahoma-Bred Juvenile Saturday night in Oklahoma City. OKLAHOMA CITY, OK—MARCH 6, 2019—Domishay, a 2-year-old colt by multiple stakes sire DOMINYUN, qualified for the $100,000 Remington Park Oklahoma-Bred Juvenile in his first career start on Saturday at Remington Park. Racing for owner Paula Villatoro and trainer Carlos Ruiz, the gray colt clocked a :17.156 time in the ninth of 11 trials on Saturday to get the 10th fastest time from 84 2-year-olds who participated on the second night Remington Park Oklahoma-Bred Futurity(RG1) trials. The second five fastest qualifiers on each night are preferred invites to the April 20th $100,000 Remington Park Oklahoma-Bred Juvenile. Making his career debut under leading jockey James Flores, Domishay finished third in his trial to Remington Futurity OK-Bred Futurity finalists Tren de Carga and Relentless. The $15,000 Heritage Place Yearling Sale graduate was bred by Laura and Dan Erickson from the Mr Eye Opener mare Salty Shay. He is a half-brother to stakes-placed Sashay Hot. CLICK HERE for the list of horses with the second five fastest times from each night.